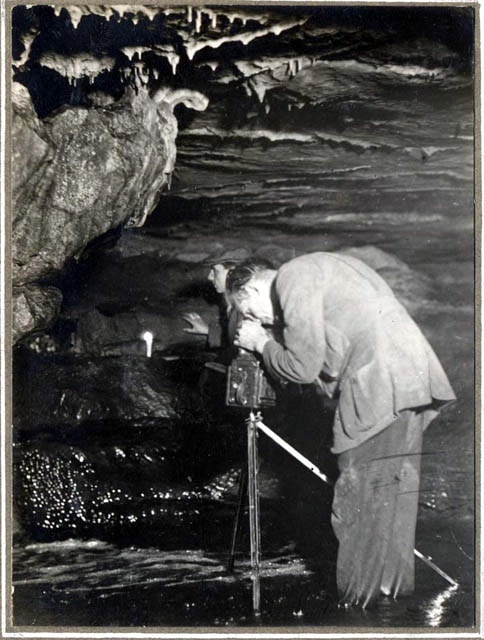 The Harold Wadsworth Haywood Collection is a set of 460 black and white photographs held in two albums, of caves and caving in the Yorkshire Dales taken between 1928 and 1934, together with 25 pages of notes on the Alum Pot area. The quality of photographs is excellent. They include a particularly fine set illustrating a trip down Lost Johns' Cave to Battle Axe via Cathedral, and some fascinating surface shots. Not only do they show how the caves looked before the war, they are also a useful record of the clothing and equipment in use when exploring caves at that time. Harold Haywood (c.1896-1935) was a Fellow of the Royal Photographic Society, and founder and President of the Leeds Cave Club. This club seems to have particularly active in the 1930s, and did a lot of work in the Alum Pot Area, Sell Gill, and Storrs Common. On his death in 1935, the collection was donated to the British Geological Survey by his sister, and was rediscovered at their Keyworth facility by Gill Nixon in about 2006. It was then digitised by the BGS and is available on their website. Gill Nixon wrote an interesting account of the collection in Volume 33 Issue 2 of the BCRA's Cave and Karst Science, also available online.